This is not a black and white photo but it looks like one. It was a very gray day. This is one of the Chicago water towers. They're an endangered species around here, but a key element to Chicago's history. According to a recent article in Preservation Magazine, after the Chicago Fire, the city required all non-residential buildings to have their own fire fighting systems. 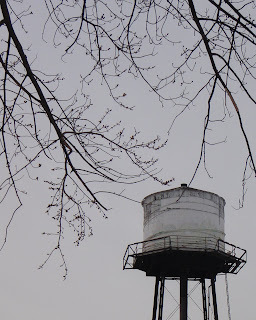 The water towers on buildings ensured that there would be water supply sources for fighting fires. There used to be thousands but now there are only about 170 left. Fantastic photo and bit of history. I've been in Chicago during those conditions. They make for great monochrome photography!